We found Little Buster Brown playing at the One Fine Day Expo and were immediately drawn in by their sound and warmth. I would highly recommend going to see Little Buster Brown at one of their showcases, not only to hear them perform, but to meet the members. One of the things we loved most about them was the incredible energy and positivity they put into their performance. They were so much fun to watch and made you feel so welcome - which is exactly how we wanted our guests to feel at the wedding. Annabelle was amazing to deal with via email - timely, professional, and patient - and made the whole process of booking the band and coordinating the day incredibly easy. My advice for any other couples interested in booking LBB is to trust in the skills and expertise that Annabelle and the band have - they know their market extremely well and will help you create an amazing sound to suit your big day. Their song list is incredible, with a wonderful mix of jazz classics right along side the latest Bruno Mars hit. Honestly, we actually struggled to pick 5 songs on the list that we didn't like, and we're still getting compliments from our guest about LBB, particularly about the flow of the music through their sets, and Annabelle's incredible vocal range. "As soon as the band began, EVERYONE was on the dance floor, from our mates, to our parents and everyone in between. The style of music was exactly what we wanted - up beat, funky, soulful and timeless. So much better than anything a DJ could have provided. It completely captured the fun and intimacy of the day. Annabelle brought an infectious energy and pizzazz to each number. I could not praise this band enough and would highly recommend to anyone wanting to add an extra element of 'special' to their wedding." "... lovely and natural sounding, brilliant assortment of songs and collection of instruments that make a one of a kind live band! Accommodating, approachable, flexible, engaging band members that weren't afraid to get involved, read the crowd, make suggestions and have fun! Their experience and professionalism is testament to how they manage and present themselves! 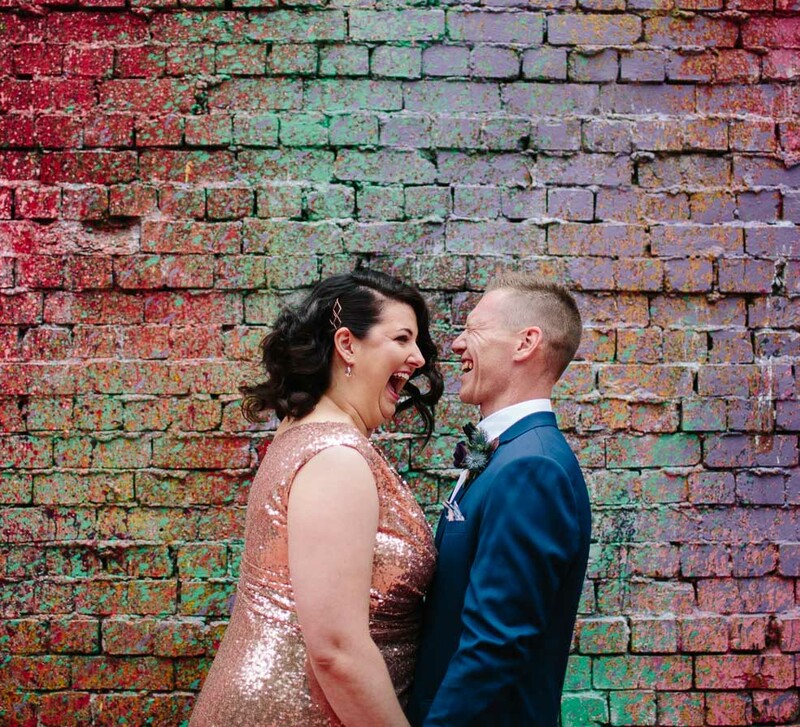 Thank you for taking the time to learn a song for our ceremony and first dance, hearing the songs performed live and in your own style made our wedding day feel so much more true and real." "When we were planning our wedding we wanted a band over DJ as we loved the wow factor a band brings. These guys were just amazing, the music really set the scene for such a beautiful wedding! Since then we have had so many friends and family comment how amazing the band was and how much fun they had at the reception. Highlight on the night was the saxophone solo with the father of the bride on the dance floor! A band worth checking out!" Partying was the brief and it was met and exceeded. We had people literally kicking their heels off! But before the dance floor was heaving our guests had beautiful ambient jazz music to settle them in to the serious side of the night (seating, speeches etc). A special shout out also goes to Little Buster Brown's gorgeous guitarist for accompanying in the church too - is there anything these guys can't do? The band made everything easy - an absolute pleasure to deal with - other than run through an epic song list and select a few faves - the hard work was taken care of by the band. They looked after all the logistics with the venue (bump in, AV, bump out) cued the music at all the right times. Good people make good music and great people make even better music! It goes without saying that all the band members were a whole heap of fun - in fact a certain bride could be found partying with them in the greenroom...! Thanks Little Buster Brown - please come back and play at our diamond anniversary - we can only imagine time will make you all the sweeter. "Having Little Buster Brown at our wedding was better than we could have ever imagined! Our wedding wouldn't have been the same without them! I have never seen so many of my family and friends having such a great time. People I have never seen dancing were up having a blast. They were able to match the mood throughout the night perfectly, doing a variety of songs and only turning it up when everyone was ready. People are still telling me how good the band was at our wedding even months afterwards. I can't recommend them highly enough!"